New Photo of Jennifer Lawrence & Lenny Kravitz in Lionsgate's 'THE HUNGER GAMES'! A new image from Lionsgate's The Hunger Games has been unveiled via Rolling Stone. 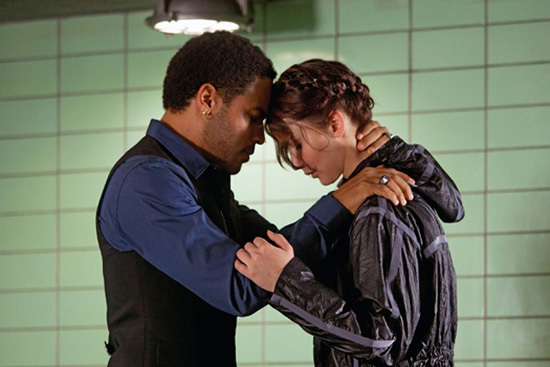 The image features Jennifer Lawrence as Katniss embrace Lenny Kravitz who plays Cinna. The movie based on Suzanne Collins' best-selling novel takes place in a dystopian future where a young woman [Lawrence] must survive a televised fight to the death between her & other teenagers from the other districts of Panem. The movie also stars Josh Hutcherson, Liam Hemsworth, Woody Harrelson, Elizabeth Banks, Wes Bentley, Toby Jones, Alexander Ludwig, Isabelle Fuhrman, Amandla Stenberg, Stanley Tucci & Donald Sutherland. The Hunger Games is directed by Gary Ross & hits theaters March 23rd. I'm reading: New Photo of Jennifer Lawrence & Lenny Kravitz in Lionsgate's 'THE HUNGER GAMES'!Tweet this!